Here again, welcome to my blog. I am away on holiday so I have found a couple of older crds to display. This one is made from honey doo garden fuschia which is painted with mica powders. I used the feathered flourinhes for the border. The more I use these flourishes the more I like them, they are becoming one of me go to stamps! I finished off with a sentiment to complete the card. As usual all the stamps are available from Honey Doo stamps. I do hope you are having a good week. 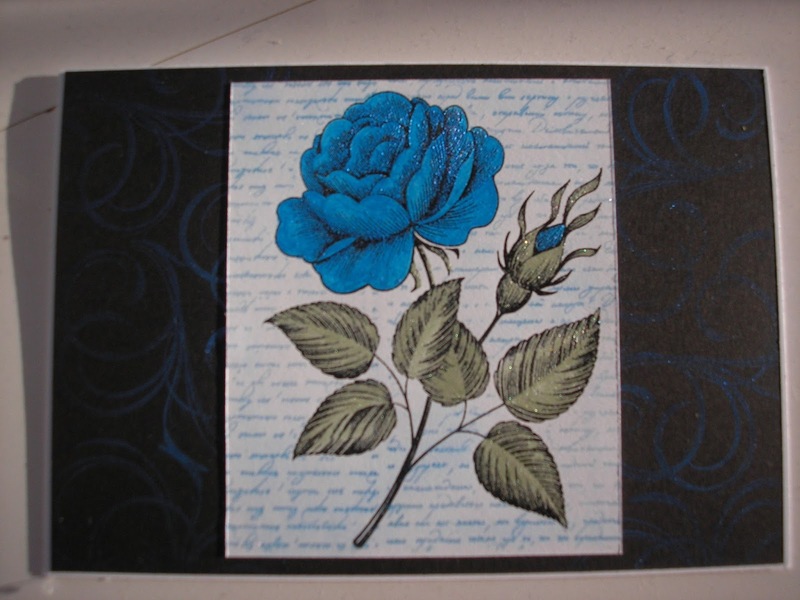 Here is a card I made in three different coloured Micas. 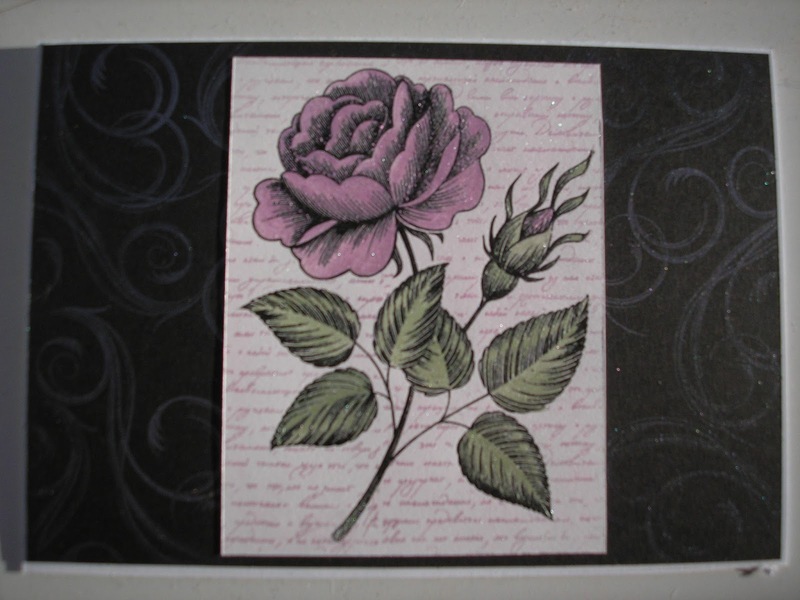 I stamped the Rose with black versafine ink and embossed with clear embossing powder. I masked it then stamped with the script background stamp and multi media glue. I added dry mica powder to give the background. 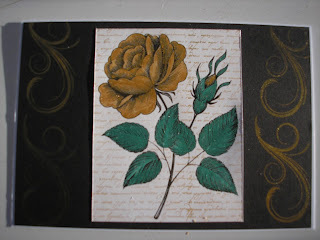 Using the same colour Mica I painted the rose. The side panels are stamped with the swirl stamps, multi media glue and coated with Mica powder., (unfortunately this doesn't show well on the photo) I find it interesting to see the difference just a change in colour makes. I hope you like them. Welcome to all you new bloggers and a special thank you to those who visit each week. 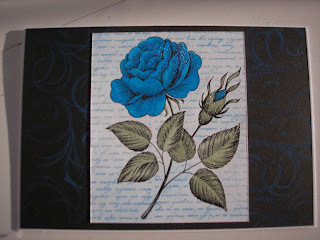 If you were watching Create and Craft last week you may recognise this card. I made it for Honey Doo crafts to showcase there new stamp range. The pretty peony was stamped and painted with mica powders. It was then masked before using the Script background to add some interest to the topper. I added distress inks to the edges completed the card by matting and layering on to Gold mirri card. The happy birthday sentiment was added and frayed hessian used as a ribbon completed the look. So sorry I am late this week, I have been away for a short break, no wi fi! Well I suppose its better late than never. Here is a simple Christmas card which I made for Honey Doo stamps. I used the shower bouquet to make a christmas tree, stamped, embossed with clear embossing powder then painted with Mica Powders. This was then matted and layered on black and gold card. Honey Doo Merry Christmas stamp was used for the sentiment. A very simple Idea which I hope you like!